← WordPress 2.5 is here! 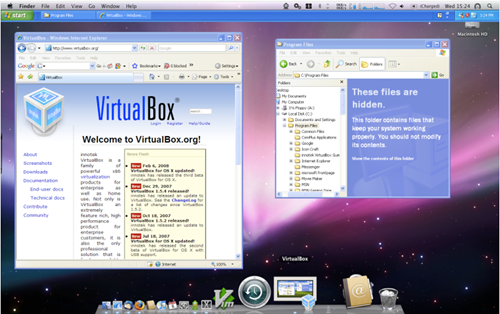 you have to checkout VirtualBox. I have been a long time Windows and Linux user for a long time and following our love for our iPhones, we just bought our first Apple 21.5" iMac – the all-in-one desktop computer. And for a few Windows app we have gotten really used to and for my wife to test some of her web development work in Windows browsers we started looking for a virtual machine solution. 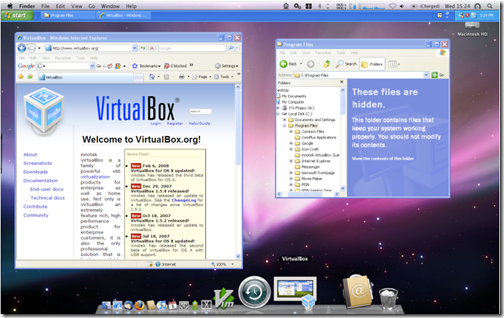 It turns out VirtualBox I have used in Linux to run Windows is available for Mac OS X as well! Supports Guest operating systems – Windows (NT 4.0, 2000, XP, Server 2003, Vista, Windows 7), Linux (2.4 and 2.6), Solaris, OpenSolaris and OpenBSD. The full edition of VirtualBox also has a few more features like Virtual USB Controllers, Remote Desktop Protocol and USB over RDP. So, if you have been wanting to play with a new operating system in your current machine without re-installing your whole machine, using a virtualization software like VirtualBox is the right way to go. You could also look at other virtualization software like VMWare, BootCamp, Parallels, etc.